From old school to new school, house to hip-hop, dubstep to dance, DJ’s bring the music that sets the tone of any event. Being a DJ today is like being a rock star in the 70’s – people can’t seem to get enough of the performance! But to become the coveted mixing maestro that everyone wants to hear, you have to gear up. Even if you’re a beginner or a seasoned Pro, you must arm yourself with the best equipment you can get your hands on. Why? Because your audience will look to you to serve and mix them music that they can get lost in. Music that speaks to their souls at the atomic level. Good DJ’s can elicit never before seen behavior and even trigger feel-good memories. That’s the real power a DJ holds, and with great power comes great responsibility. Your responsibility now lies in selecting the backbone of your setup: the DJ Mixer. This comprehensive guide will review the best DJ mixers for the money available today for both beginners and pros. There will also be a crash course for newbie DJ’s on how a mixer works and why it’s needed in every setup. Pros who don’t need a history lesson can jump straight to the review section of this guide. Now, are you ready to rock? Let’s begin. You thought being a DJ was all about turntables, headphones and attitude? Not anymore! These days, being a DJ entails having a plethora of equipment. A typical setup usually has a pair of headphones, speakers, turntables, a computer, and software. But the most crucial part of a DJ’s set up is the hardware that ties these all together: the DJ Mixer. The DJ Mixer has many uses depending on what type of DJ is using it. House DJ’s need an audio mixing console like a DJ Mixer to make smooth transitions between songs in a set. Turntablists and Hip-hop DJ’s use mixers as a musical instrument to create new sounds, like scratches, loops, and beats. Using a DJ Mixer, a DJ can use headphones to preview the next song so they can match the beat to the current one. DJ Mixers on the low to mid-end of the price spectrum can only take in two CD players or turntables, while some higher priced ones can take up to four. It doesn’t matter where music comes from – vinyl turntables, cassettes, CDJs or DJ software on a computer. A DJ needs a DJ Mixer to be an effective entertainer. The main difference between a DJ Mixer and large, professional mixers are the inputs. Sound recording mixers have anywhere from 24 to 96 inputs, while a DJ mixer only has two to four. The most important feature that DJ’s need from a mixer is the ability to cue the audio of a non-playing source straight to their headphones. By doing so, the DJ can zero-in on any part of a song he wants. With the help of a crossfader, the DJ can now transition smoothly between two sources of music. Larger audio mixers seldom have this capability. What is a crossfader? 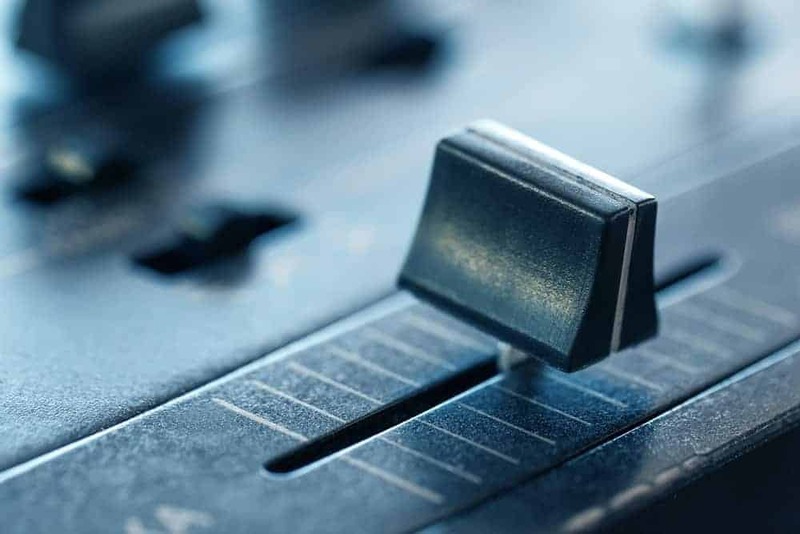 A crossfader controls the output of all audio sources the DJ has at her disposal. Think of a sliding bar with three positions: left, midpoint and right. Audio source A is the left position, while audio source B is the right. Dragging the bar to any one position all the way will allow the DJ to output sound from only that source. Setting the crossfader bar at midpoint will output audio from both A and B sources. Vinyl turntables are the cool classics of a bygone era. While these bad boys are fantastic, their signal is often too weak when amplified using a regular PA system. The secret to using turntables is to pre-amplify them utilizing the phono amplifier on a DJ Mixer. DJ Mixers also have equalizers for bass and treble control on each channel, so DJ’s have total power over their music. Most mixers also have a mic input for DJ’s who like to vocalize or make announcements. There is also a kill switch on some models, which can cut out a channel or frequency. During an event like a rave or party, the output from a DJ Mixer plugs into a sound reinforcement system or SRS. An SRS consists of power amplifiers that enhance the signal output for speakers. 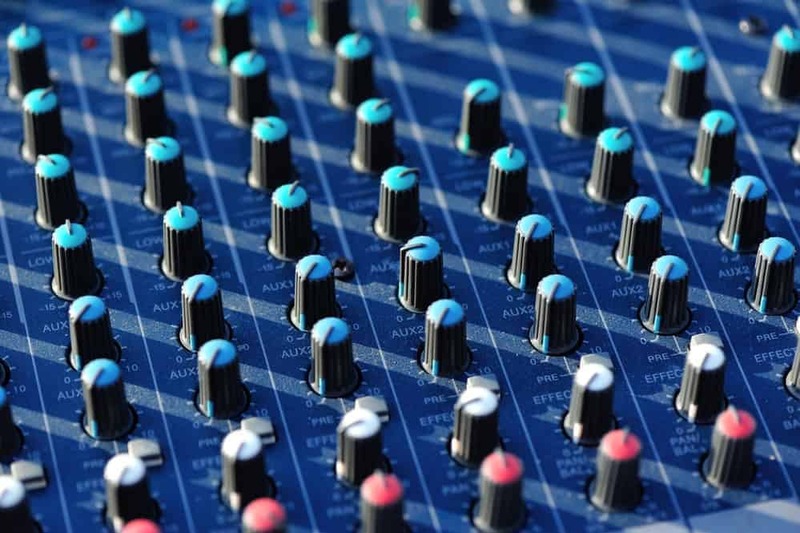 The DJ Mixer’s output connects into whatever the situation calls for, whether it’s a radio broadcast or a studio recording. Remember the song, “Panic” by The Smiths? The last thing you want to hear from your audience are chants of Hang the DJ, so choosing the right DJ Mixer is critical. There are a few essential features to look out for when shopping for hardware. Channels – The number of audio sources you can mix. The average is two channels, one for each deck. Channel Equalizer – Lets you adjust the channel’s frequency bands. The best mixers have separate three-band equalizers for each channel (high, mid, low). BPM Counter – A beats per minute counter detects the tempo of a song playing on any given channel used for beatmatching. Gain Control – Used to set the master level of all channels. Separate gain controls for each channel is better. FX Sampler – Add effects and distortion to any track, which DJ’s can sample before playing. Mixer Output – Includes a master out, headphone jack, and outputs for recording and monitoring. Level Meter – An LED strip that shows the volume of a track and moves to its beat. This feature is a must, especially separate meters for each channel and the main output. Input – The number of inputs on a DJ Mixer. Microphone Input – Lets you plug in a mic to the DJ Mixer. This concludes the beginner’s section of our guide. We know from experience that before jumping in and spending a good chunk of cash on equipment, it’s always prudent to know the facts first. As music lovers and connoisseurs of excellent DJ equipment, it’s our job to help you, Dear Reader, make an informed decision. We know what it’s like to shop for DJing hardware, only to get frustrated and flustered in the end. We know what it feels like to plunk down cold hard cash for a piece of hardware that didn’t even come close to the hype it was riding on. Yes, we have been there, and we have done that. It wasn’t all pretty, but in the end, we amassed quite a formidable setup that’s fit for DJ royalty. Remember, DJing is an art for some people. For others, it’s a creative outlet. Some use it to meditate, while others use it to escape. It could be a combination of them all for you, which is a beautiful thing. Now, put on your business socks and let’s get you geared up! Version 1 of the Mackie ProFX Series was good. Really good. Version 2? It blows the doors off the previous iteration and sounds better than ever. The ProFX12V2 mixer is a lot more flexible than its stablemates in the ProFX series. The Mackie ProFX12V2 mixer is portable, compact, efficient, and easy to use. It has a massive 12 inputs for a mixer this small and comes with plenty of effects suitable for any event. If you plan to go live in front of an audience, you can’t go wrong with the Mackie ProFX12V2 mixer. Connecting musical instruments (bass, guitar) is easy. Let’s face it, having a professional sound engineer on hand is not always possible, especially for small events and local shows. If you don’t want to sound awful, you need a pro-level DJ mixer that packs a lot of outstanding features. These features will ensure that you sound fantastic all the time. With the Mackie ProFX12V2 mixer, you’ll always perform at a higher level. It has 8 fader channels that control the 12 inputs. All the channel strips have a dedicated fader, mute button, pan dial, AUX monitor and FX dials. The 3-band EQ (80 Hz, 2.5 kHz, 12 kHz) ranges from the low-shelf, The first 6 stripes features individual microphone units. The first strip has a switchable line/Hi-Z ¼ balanced/unbalanced jack input, and ¼ jack insert input. The master output of this pro DJ mixer has a 7-band graphic EQ, switchable for tuning mains or monitors. You also get an AUX output for a monitor mix. The Mackie ProFX12V2 mixer also comes with a 3-band equalizer on all three input channels. The Mackie pro mixer has 16 effects that you can use in any situation. Switch and select each one by just scrolling up or down using a dial. You’ll see a numbered list showing each effect next to a display showing the current effect. This is a convenient way to structure the effects to make them more usable. Choose from a variety of effects such as Bright Room, Warm Lounge, Small Stage and Concert Hall to name a few. 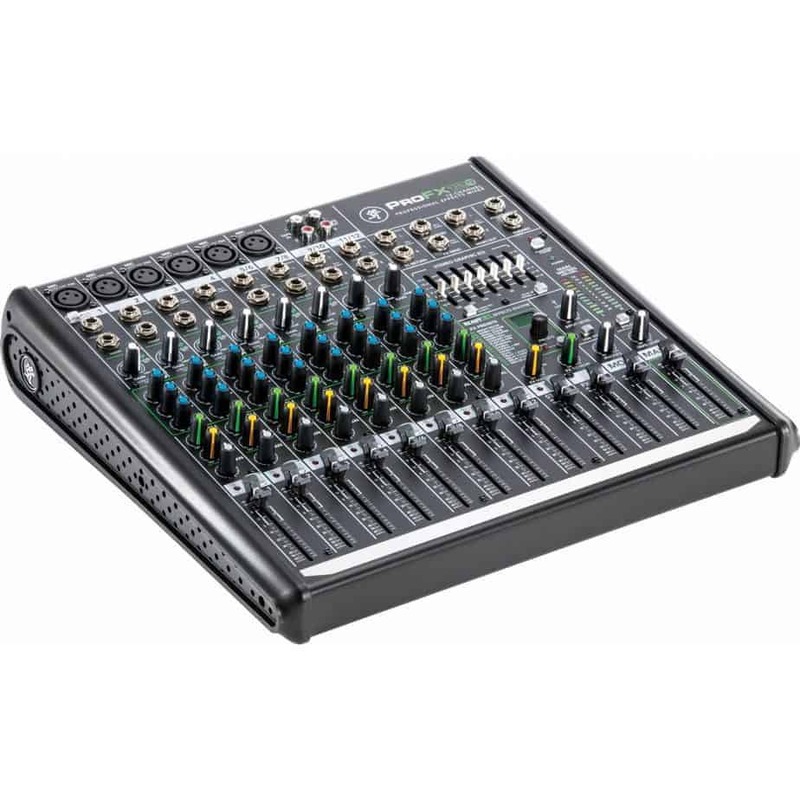 The Mackie ProFX12V2 mixer also has USB connectivity for laptops and digital music players. This feature is great for DJs looking to expand their repertoire or become more flexible. With USB connectivity, you can record all your performances or automate the next set of tracks when you need to take a break. The Mackie ProFX mixer checks all the boxes of what a DJ mixer should be. There’s almost nothing wrong about this small wonder, and a vast majority of the people who buy a Mackie love it. Compact, easy to use, and versatile, the Mackie PROFX12V2 is a worthy addition to any DJ setup. Consumer reviews on this mixer are always positive because the Mackie doesn’t compromise. It may be small, but this DJ mixer packs a lot of features that make larger mixers green with envy. Numark is a brand famous for producing high-quality DJ equipment. Their products are sleek, responsive, have interactive controls and offer reliable performance. Numark’s revolutionary products are favorites among beginners and pro DJs alike. The Numark M6 USB DJ mixer offers a combination of cutting-edge tech and classic design. The M6 also has an excellent value proposition that you can’t pass up. 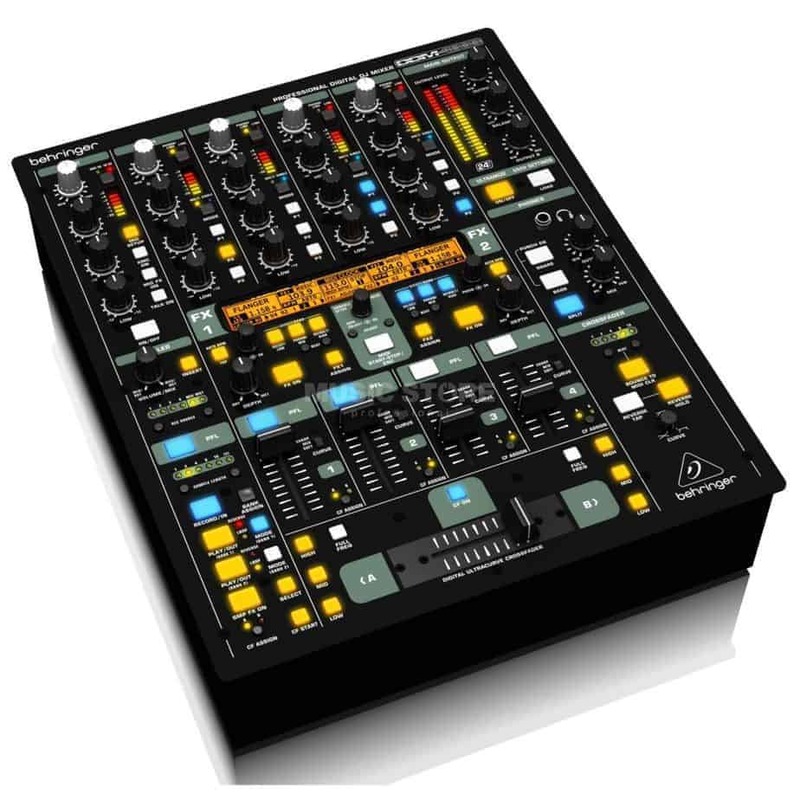 Take a gander at our review and read why this DJ mixer made our top 5! When it comes to choosing a DJ mixer, it almost always boils down to features. DJs of all shapes and sizes love simple controls, and the Numark M6 mixer delivers in spades! Dials for the master control and crossfader are conveniently located. It’s also easy to access the controls for each deck. 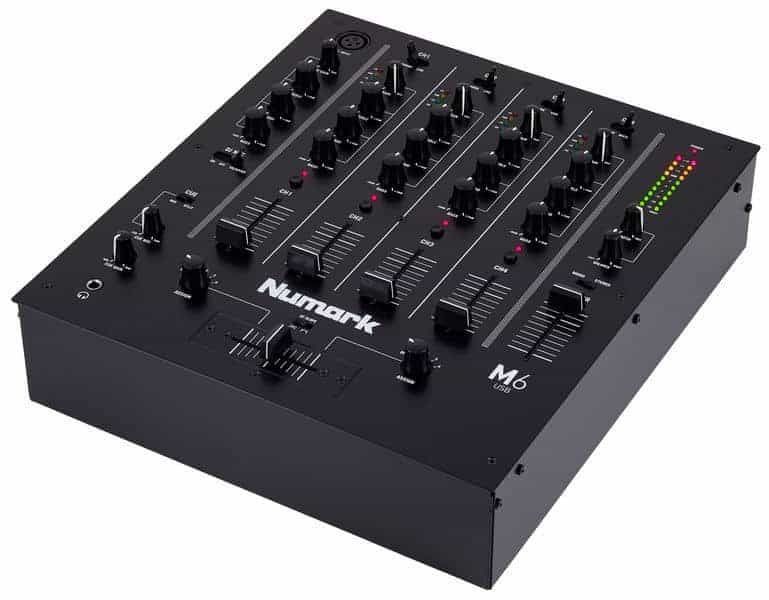 What differentiates the Numark M6 mixer from others in the company’s lineup is the USB connectivity feature. The mixer has plug-and-play functionality, making it easy to connect a laptop so you can mix audio using music player software. You will also be able to record your tracks straight to your USB connected device. With four channels, this mixer can handle music from four different sources. 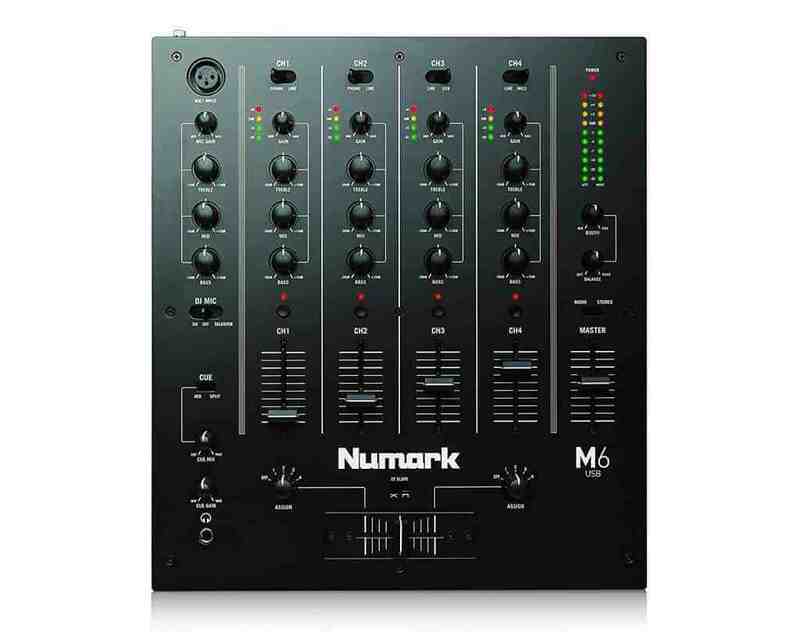 The Numark M6’s price point makes it an excellent choice for beginners who want to buy a brand new DJ mixer but don’t want to break the bank doing it. Because the mixer comes loaded with options, it’s a fun and exciting buy, even for the experienced pro. No DJ mixer is perfect, and the M6 has its share of pros and cons. The good news is that the positives far outweigh the negatives, and a lot is going for this sleek beat blender. Take, for example, the number of channels the M6 has. This mixer has four channels compared to two for similar priced entry-level DJ mixers. The only major issue of the Numark M6 USB is it’s a large and clunky piece of equipment. It’s absolutely huge! If you’re looking for a compact and portable DJ mixer, you’ll have to look elsewhere. 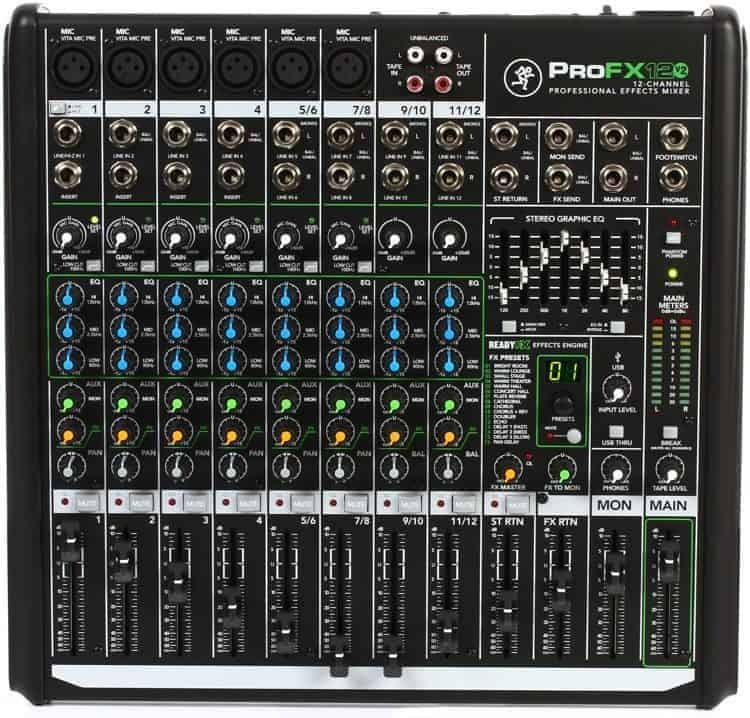 The Mackie PROFX12V2 is good starting mixer for the compact category. Now, let’s take a closer look at the pros and cons of the M6. If you’re new to DJing and would like to get your hands on some entry-level tech that won’t burn a hole in your wallet, get the Numark M6 USB. It’s a fantastic mixer for the price, loaded with premium features often reserved for DJ mixers on the next tier. The Numark M6 punches well above its weight. Your performance will too, should you choose to grab this mixer and make it the cornerstone of your budding DJ career. It’s simple, sleek, powerful and offers impressive sound quality. Perfect for small gatherings and parties. There’s something about products made in Germany that scream quality, performance, and craftsmanship. All you have to do is check out a BMW or Mercedes Benz to know that these guys mean business. Throw in a Swiss engineer behind the helm, and you’ve got yourself a winner! The Behringer brand is world famous for well-made audio equipment of the highest quality. With a sales network represented in 130 countries, you’re apt to see a Behringer in use everywhere you go. The company is also well-loved by its customers, who rate Behringer audio equipment as one of the best. Come closer, the Behringer DDM4000 DJ Mixer won’t bite! Your initial reaction when you first see this mammoth mixer is frightened awe. The DDM4000’s buttons, dials and multi-function monitor can be intimidating at first glance. But really, this Behringer DJ mixer is easier to operate than it looks. The Behringer DDM4000’s controls are convenient and easy to use. They’re actually quite intuitive and positioned very well, even beginners will find it easy to use. The large, professional panel has plenty of extra controls and features. Plus, it’s fully digital! If you feel that playtime’s over and it’s time to get serious with your DJ career, then the Behringer DDM4000 is what the doctor DJ ordered. Let’s take a look at what makes this baby tick. The controls of this DJ mixer are very convenient and well-placed. From the crossfader positioned at the bottom center, to the mic controls on the top left, `you won’t feel lost when using the DDM4000. The master controls sit on the top right, out of the way and chill so you can focus on playing your music. Adjustments made on the Behringer DDM4000 DJ mixer are easy thanks to the user setting button. You can try and save any configuration you wish, recalling it with a press of a button. One notable feature on the Behringer DDM4000 is the Mic Setup button. Here, you can adjust all the settings of your microphone, with the option of adding effects, panning, and other nifty tricks. The DDM4000 has four input channels that can support two devices connected at the same time. There are also MIDI connectors that let you control and sync your DJ equipment. For your outputs, you get two XLR connectors, each complimented with RCA connectors which you can control separately. The sound quality on the Behringer DJ mixer is good and got high marks from many of its users. There’s a slight whine when you turn the mic on, which is easily adjusted with the mic EQ. The line and phono inputs also emit minor noises that become quiet when a turntable is plugged in. Like the other DJ mixers that went before it in our review, the Behringer DDM4000 also has its share of good and bad. There comes a time in every DJ’s life where a level change is imminent. If you feel that you need to change it up, start with your DJ mixer and look at the Behringer DDM4000. It’s not the smallest mixer, but it’s light, easy to use and very versatile. The Behringer has many features and offers powerful performance for the price. It’s also a fully digital mixer that plays well with analog sources. If you use iPods and turntables a lot, get this DJ mixer. It looks great, performs well and is a fantastic piece of hardware. Sing, and the world sings with you. OK, we changed that saying a little bit. But you get the picture. It’s not enough for DJs to dish out set after dazzling set of music these days. No sir. These days, fans expect their favorite DJs to vocalize as well. To write lyrics and sing to their own beat. Ace DJ Calvin Harris sang, wrote, and produced the hit song “Summer.” Kaskade meanwhile, wrote, sang, and produced the very catchy hit, “Atmosphere.” DJs writing and singing their own songs isn’t unprecedented at all. If you’re looking to follow Kaskade and Calvin down this rabbit hole, you need a capable DJ mixer to get you to the other side. You need a mixer like the Behringer DJX750 in your arsenal. 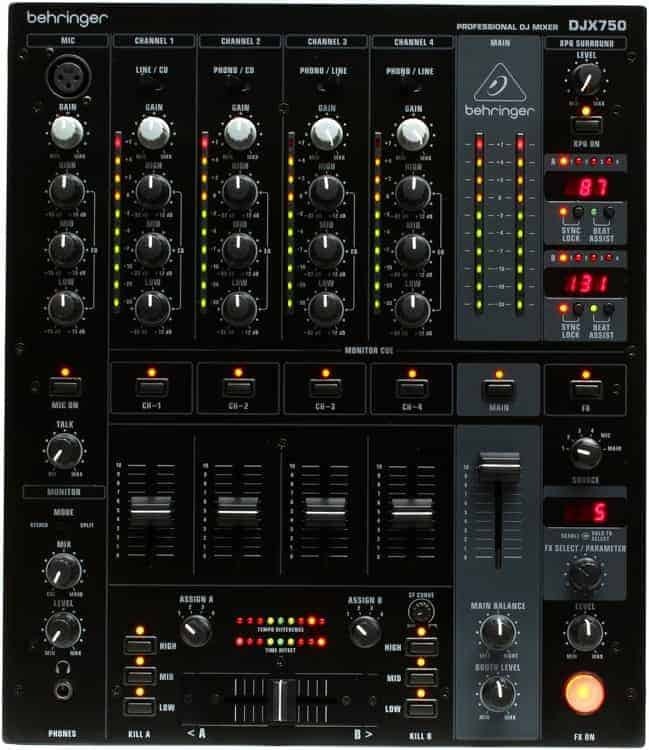 The Behringer DJX750 DJ mixer is a beautiful piece of hardware. Its build quality is impressive, it has excellent digital effects, and it’s easy to use. If you’re on the fringes of going pro and want a more professional sounding rig, you can’t go wrong with the DJX750. This 5-channel DJ mixer produces clean and clear audio for the ultimate dance floor music. The Behringer DJX750 was born and bred for the club. Premium features like a multitasking monitor, crisp sound and stylish design make this DJ mixer a favorite among DJs. When it comes to inputs and features that enhance each one, the DJX750 is king. It has a convenient, built-in microphone channel for DJ vocalization if you want to sing like Calvin Harris or get the crowd going. You can even fine-tune your vocals with a dedicated 3-band EQ. The stereo channels have an integrated equalizer with frequencies of 12 dB to -32 dB. The Behringer DJX750 has channels that can handle audio from different sources. You can play with phono, CDJ, MP3, turntables, and more! One thing you can be sure of when you get the Behringer pro mixer is the superb sound quality. While the excellent sound isn’t a feature per se, it adds a whole other dimension to this DJ mixer and makes it better. The DJX750 has preamps that use ULN (ultra-low noise) technology to provide crisp and clean sound, with low noise distortion. This DJ mixer has the best audio when compared to other mixers with the same specs and price tier. The very best DJ’s are master multitaskers, so they make it a point to choose their mixers wisely. For the best performance of your life, your DJ mixer must have a multitasking monitor feature. The Behringer DJX750 has a monitor that can give you the edge on the stage or in the club. The Behringer lets you choose between “split” position or “stereo” mode. Turn the MIX control counterclockwise if you want to hear the PFL signal. You can also listen to one or more sources, illuminated by LED indicators. Not all faders are created equal, and the Behringer DJX750 pro mixer is like a god among men. The faders on this bad boy are of the high-grade, 45 mm ultra-glide variety. These faders have a 500,000 life-cycle expectancy, which is why the faders on the DJX750 outperforms everyone else. 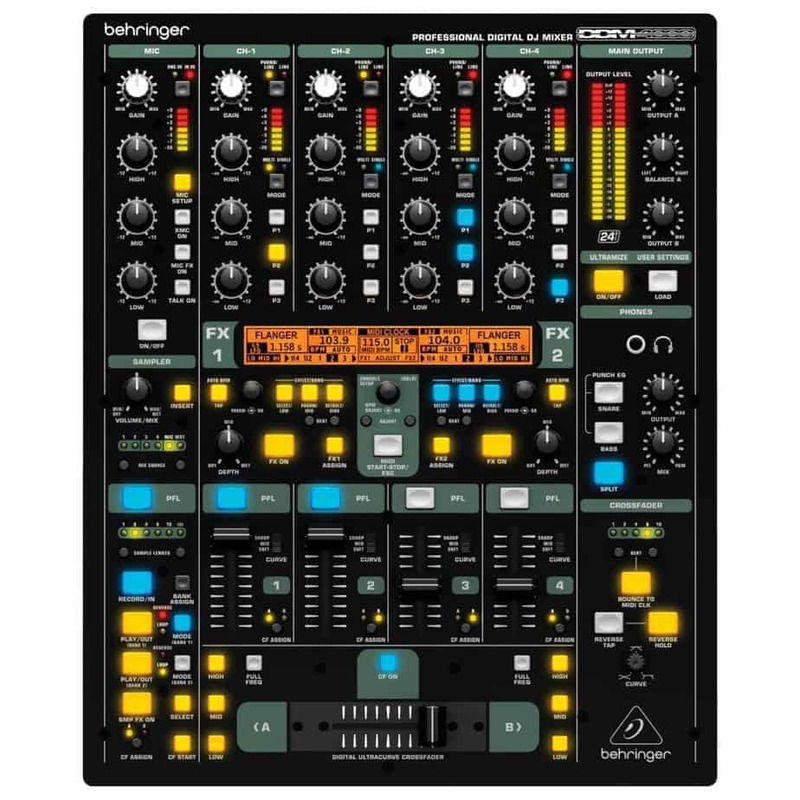 The crossfader on the Behringer DJ mixer uses a VCA or voltage controlled amp technology. This tech results in almost no noise coming from the mixer. You can also customize the crossfader to adapt to any situation. If you want to be a more engaging DJ, the Behringer DJX750 lets you go on vocals, be yourself and sound great while doing it. This pro DJ mixer is a pretty solid choice due to all its features, performance, and sound quality. The Behringer pro mixer is a worthwhile investment you’ll be using for a long time. Numark is a brand known for introducing new technologies and innovative strategies. The company produces a variety of audio tech for both beginners and seasoned DJs alike. Whether it’s hitting the stage or playing a rave, spinning on a Numark is spinning in style. The Numark M2 is a two-channel scratch mixer that gets the job done. It has more than adequate features in a DJ mixer, and for the price, you’re getting a lot in return. Let’s take a closer look. 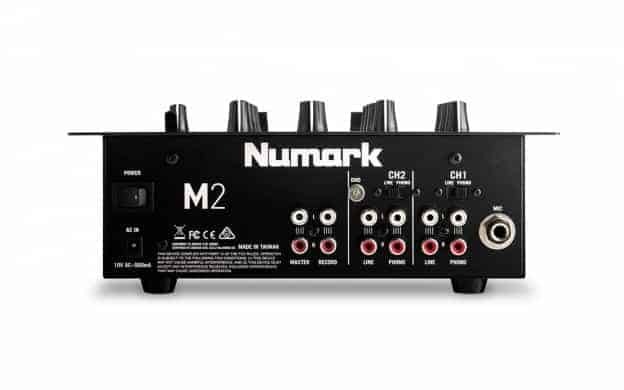 The main selling point of the Numark M2 DJ mixer is its value proposition. This mixer is affordable enough for DJs who are starting out and don’t want to spend too much into an entry level item. Granted, not everyone bases his or her decision on price alone when shopping for a DJ mixer. With enough essential features that get the job done, the Numark M2 is a solid player among mixers in its class. Although the Numark M2’s design layout is simple, the build quality is solid. With only the essential controls on board, the interface isn’t intimidating at all. It’s easy to use and lightweight enough to take with you on any type of gig. When it comes to sound quality, the M2 doesn’t disappoint. Every tune and beat has a satisfying quality to it that seems like it came from a bigger mixer. A mic input with a dedicated 3-band equalizer can get any party started real quick. The Numark M2 DJ mixer also gives you a 3-band EQ on each channel AND gain, with a crossfader-reverse option to boot. The only limit to this dynamo’s performance is your skill, so be sure to bring it every time you get behind the M2. Worried about bass control? Don’t be! The Numark M2 self-adjusts at the right frequency so you won’t have a bass that’s either too low or too high. Another great thing about the M2 is the sliders for the crossfader and channels 1 – 2 slides like a hot knife on butter. There’s also a USB output that you can connect to any computer, regardless of the operating system. With USB connectivity, you can record tracks or performances with ease using any software. The Numark M2 is a solid piece of hardware that delivers on everything it promises to do. The only drawback to this Numark mixer is that it’s very basic kit. Even with limited controls and functions, the Numark M2 mixer delivers every time, no matter your setup. Its simple and easy to use, with controls that are configured really well. The sound quality is also crisp and clear coming from such a small mixer. 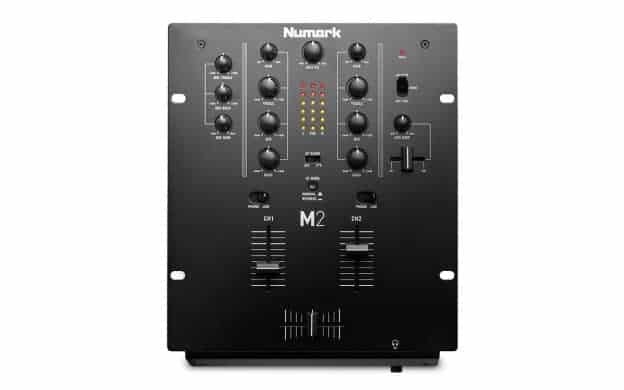 If you’re starting out as a DJ, or you want to augment your mixer collection, you can’t go wrong with the Numark M2. Its performance and affordability are second to none. Choosing the perfect DJ mixer can be a daunting experience. We’ll be honest – choosing one is not the easiest thing in the world to do. After all, a DJ mixer is an investment, and investments always involve money. There are many factors to consider and a lot of “it depends” moments will pop up after a question. If you’re a total newbie to the game, looking at a row of mixers would be akin to staring at the controls of an airplane – it can be super confusing! You have to determine your skill level first. Complete beginners start at level 0 for example, and seasoned pros are at level 10. Where would you fall into this spectrum? You must at least have an idea of where your skills are at before you decide what mixer to buy. Analog versus Digital is like an age-old question that plenty of DJs ask. If you’re starting out, we recommend getting an analog, entry-level mixer first. One that you can take with you on every event and one that you wouldn’t mind handling rough. Digital mixers tend to be a little more confusing to learn if you have no experience. Well, sound is subjective, and it’s a little difficult to determine if analog sounds better than digital. Ever hear about purists who love vinyl records, but loathe CDs? It’s more or less the same thing with DJ mixers, but without the hate! DJs are chill people, and we don’t have time to hate. Let’s end this debate by saying that the sound will always depend on you: your skills, your ears, and your soul. If you have a good ear and the music resonates with your soul, you’ll know when a something sounds good or not. There are million other factors to consider, but for the sake of not turning this guide into an e-book, let us summarize them! Decide how many channels you need. Most mixers have at least two. It’s OK to start with a 2-channel mixer if you’re on a tight budget but always aim for more to future-proof your setup. Choose a brand and do your research about the company. Read user reviews and guides such as this. Buy a high-quality carrying case to protect your investment. Mixers are the backbone of a DJs set up, and performances would be impossible without one. This is the reason we wrote this guide because choosing the right DJ mixer can mean life or death for the DJs career. Remember, choose your mixer well, and it will serve you for a long time. We hope this guide helps you on your quest to buy the top mixer on the market and become better DJ. Until next time! We’re sure you have plenty of questions about DJing, equipment and other stuff. Don’t worry, we’re here to help! We compiled all the best questions thrown our way and came up with this extensive Q&A session. Remember, you can always ask us a question using the comments section at the bottom of the page. According to Wikipedia, a DJ (short for Disc Jockey) is a person who plays existing recorded music for a live audience. 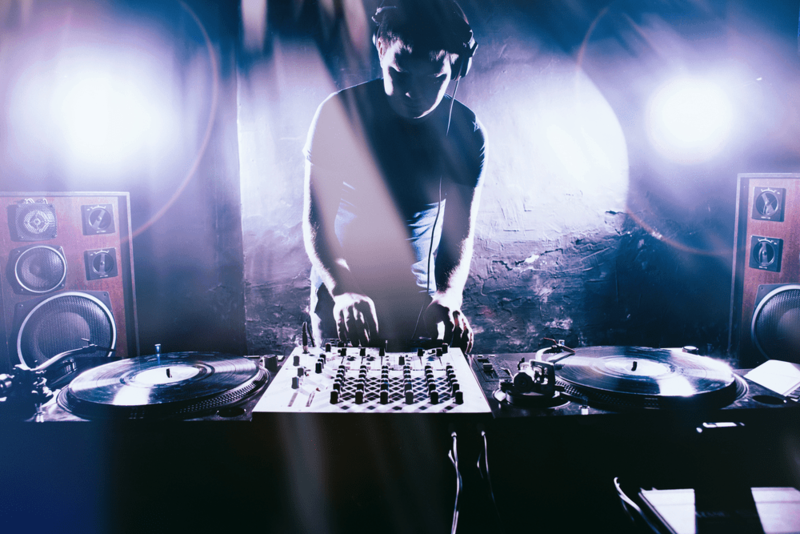 Most common types of DJs include radio DJ, club DJ who performs at a nightclub or music festival and turntablist who uses record players, usually turntables, to manipulate sounds on phonograph records. Our definition of DJ is way better: A DJ is the God of parties, raves, nightclubs, and other live events. Without a DJ, the party is dead. Can I become a DJ? You bet! Anyone can become a DJ. In fact, DJs come from all walks of life and in all shapes and sizes. What do I need to become a successful DJ? First, you need to be able to carry a beat, both in your head and in your hands. If you can create a good rhythm with your fingers on any surface, you’re good. Second, you need to be able to carry a tune and NOT be tone deaf. Last but not least, you need to be passionate about the craft and yearn to learn more. Always be curious and experiment with things. What equipment does a DJ need? Your setup will depend on what type of DJ you want to be. A turntablist would need 2 DJ turntables, a mixer and vinyl records. If you’re more inclined to use digital audio, you might need a laptop or CD DJ turntables (or both). This article is pretty much covers everything. A DJ mixer is a type of audio mixing console used by DJs to control and manipulate multiple audio signals. The DJ mixer has many uses depending on what type of DJ is using it. House DJ’s need an audio mixing console like a DJ mixer to make smooth transitions between songs in a set. Turntablists and Hip-hop DJ’s use mixers as a musical instrument to create new sounds, like scratches, loops, and beats. Do I really need a DJ mixer? Yes. Without it, you won’t be able to transition from one track to the next. You also won’t be able to manipulate audio sources to create new sounds. How do I choose a good DJ mixer? In-depth guides like this one (yes, the one you just read) can help you pick the best one! Rule of thumb: find out what type of DJ you are first. Your preferences and even pricing requirements will change depending on what you’re going to be using the mixer for. For example, if the price is a factor, the Numark M6 won’t disappoint. If you’re looking for the best bang for your buck DJ mixer, the Mackie PROFX12V2 is a solid choice, and so on. Know what you want and how much you’re willing to spend, do your research, then decide. Where can I buy a DJ mixer? You can get DJ mixers at your local audio store. You can also source these online using sites such as Amazon, where the prices are more competitive when compared to mixers you can buy locally.